Cape Town - Former England batsman James Taylor has named his best-ever cricket XI, with three South Africans of which two are fairly unlikely picks. Taylor revealed his all-time XI on the Lord's Cricket YouTube channel, with the criteria being that he had to have played with or against them, or have been strongly influenced by the players mentioned. He named the usual suspects, which included Sachin Tendulkar and Shane Warne, both of whom regularly make such lists. A notable Protea to make these lists is AB de Villiers, who slotted in at No 4 in Taylor's selection. De Villiers, who has returned from a year-long sabbatical in red ball cricket, has played 106 Tests for the Proteas to date and scored 8074 runs with an average of 50.46. In at No 5 in Taylor's all-time eleven was former Proteas batsman HD Ackerman. Ackerman played in only four Tests for South Africa scoring 161 runs at an average of 20.12. "I certainly know him very well... He taught me a lot when I was playing at Leicestershire," said Taylor. "He's a great guy and his knowledge of the game is unbelievable and he helped me with my game." Ackerman, who used to be a regular commentator for SuperSport, relocated to Australia in September last year. The third South African to feature in Taylor's team is former Proteas spinner Claude Henderson. Henderson, who is the current spin bowling coach for the national team, played seven Tests and four ODIs for the Proteas. When referring to Henderson, Taylor says that the spinner "bamboozled batsman" and helped him take catches and improve his statistics when he was at Leicestershire. 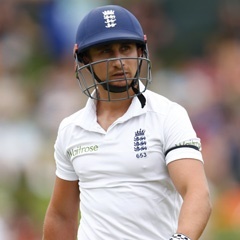 Taylor, who was forced to retire from international cricket last year due to a rare heart condition, played seven Tests and 27 ODIs for England. He recently returned to cricket, joining Northamptonshire's coaching team earlier this year.